An indispensable travel guide for camping enthusiasts! Not only does it describe the loveliest campsites in Great Britain, Ireland, France, Spain and Portugal, the guide is full of tourist information about all these wonderful destinations. It really is a guide to find your perfect overnight spot while still at home or on the road. Choose from more than 3,000 campsites! 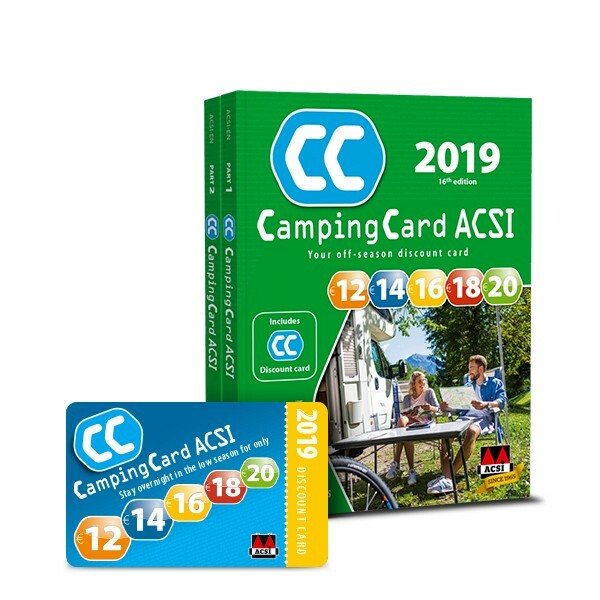 It includes CampingCard ACSI (the discount card for the low season) and uses the same campsite information as the ACSI Campsites Europe app. Find your ideal campsite in the ACSI Campsite Guide. It’s a complete travel guide with extensive information about more than 3,000 campsites in the most popular holiday destinations in Europe. Find out everything about amenities, guide prices and routes to the campsite, and be inspired by our information about the regions. We’ll tell you about the countryside, the history, the culture and what you can do there. All campsites are visited by us each year so the information is always reliable and up to date. To sum up, you will also receive the CampingCard ACSI discount card for the low season. You will recognise the participating campsites by the blue CC logo. But there are many more campsites in Europe that accept the discount card. You can find them on CampingCard.com. Using the CampingCard ACSI discount card you can stay overnight in the low season at a fixed, low rate (€12, €14, €16, €18 or €20 per night) at more than 3,400 campsites in Europe. All you need to do is complete your details on the card and present it at the campsite reception. Symbols in the ACSI Campsite Guide indicate which campsites accept the CampingCard ACSI discount card. Check out CampingCard.com for more information about CampingCard ACSI and for the exact acceptance dates for each campsite. Suitable for smartphones and tablets (Android 4 +, iOS7 + and Windows 10) and for laptops and computers (Windows 10). 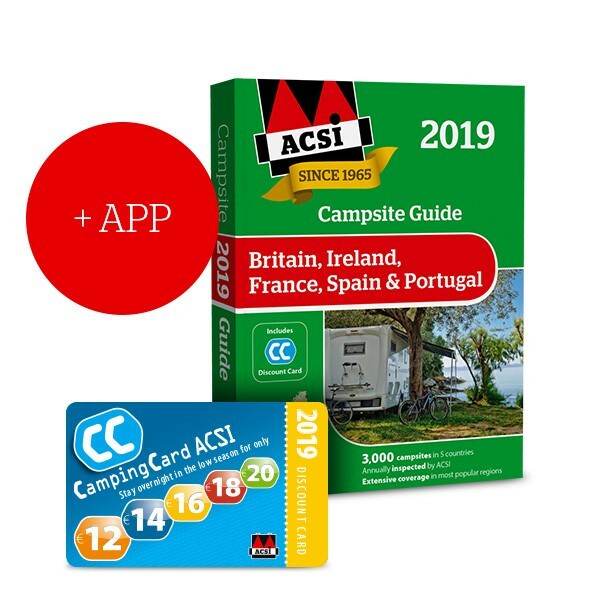 The ACSI Campsite Guide 2019 with information about more than 3,000 campsites in Great Britain, Ireland, France, Spain and Portugal. You can camp at great value rates with CampingCard ACSI. Save up to 60% on overnight stays in the low season and order the two-part CampingCard ACSI guide, including the accompanying discount card. You can benefit from up to 60% discounts on overnight rates when you show your CampingCard ACSI discount card. The two-part CampingCard ACSI guide gives an overview of all participating campsites, including amenities and acceptance dates. CampingCard ACSI is ideal for campers who like to go on holiday in the low season. At participating campsites, you will pay a fixed low overnight rate of just € 12, € 14, € 16, € 18 or € 20 per night. In the guide you can easily see what rate the campsite charges. Do you like to go camping for more than four nights in the spring or autumn? That's all it will take to recoup the cost of CampingCard ACSI in many cases. Don't pay too much for your overnight stays, and order CampingCard ACSI now. * The exact dates differ per campsite. The guide states in which periods each campsite accepts the discount card. ** Based on regular overnight rates in May, June and September.